Nigel de Jong of the Netherlands kicks the ball during a training session at Itaquerao Stadium in Sao Paulo, Brazil. It’s time for the last round of the group stage, which means the complex hypothetical scenarios for how each team will finish in each group will finally achieve resolution. The Netherlands and Chile are already guaranteed a trip to the Round of 16, but whom will they face? It depends on who wins and what happens in Group A, where Brazil isn’t yet guaranteed a berth. If the Selecao do make it, it’s not clear whether they’ll be first or second in their group, which means it’s not clear how it’s best to avoid Brazil in the next round, which means it’s not clear whether the Netherlands or Chile want to win or lose, which means … oh, God. Somebody pass the remote. Once you find a remote, choose your television’s picture-in-picture option. Without it, a choice must be made: there are two sets of overlapping games Monday. Ignore the Australia-Spain match, unless you have an affinity for fallen dynasties or former penal colonies. Australia’s star striker, Tim Cahill (he of the gunpowder foot), is barred from playing because of back-to-back yellow cards in the Socceroos’ previous two games. And Spain’s two losses against the Netherlands and Chile have taken 3.36 points off its Soccer Power Index (SPI) mark — still good for eighth in the world, but that doesn’t matter anymore. Sixteen teams are going on to the knockout round, and Spain’s not one of them. The more important noon match is in Sao Paolo, Brazil, where the Netherlands and Chile have everything to play for and nothing to lose. The two teams are separated by only a 1.56-point gap in the SPI rankings (Chile is fifth in the world; Netherlands seventh), and both teams have already earned six points in the group and a spot in the Round of 16. But what happens in this game sets other events in motion come the next round. 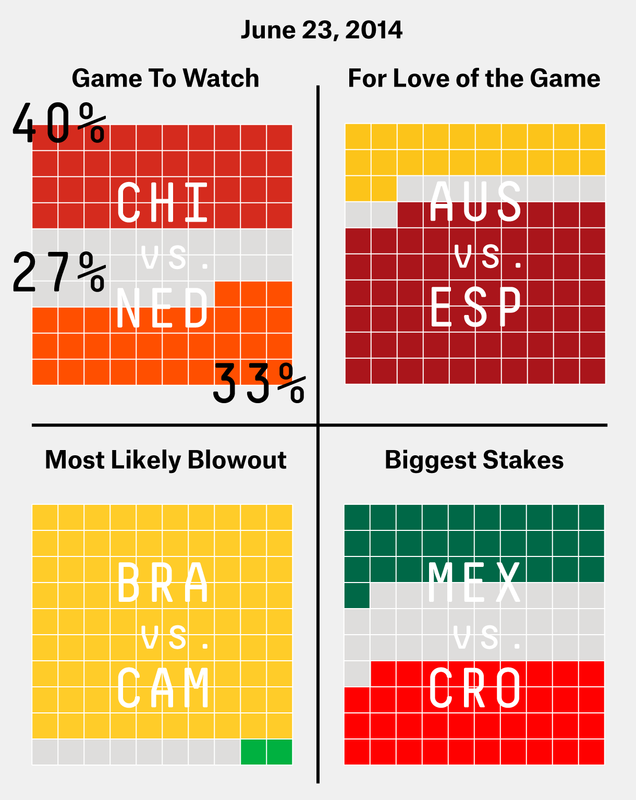 Chile has a 40 percent chance of beating the Dutch, according to our model, which would place it No. 1 in Group B and mean it would play the No. 2 finisher from Group A (Brazil, Mexico, Croatia and Cameroon’s group). If the Dutch can overcome those odds to win (they have a 33 percent chance), they’ll nab the top slot. If the two teams tie, they’ll have the same number of points but the Dutch will own the top position because of their higher goal differential (+5 to +4). In other words, the Dutch have about a 60 percent chance of being the No. 1 seed, even though the most likely outcome of the game is that they lose. But whom will the Netherlands and Chile play? One will probably be playing Brazil, unless Cameroon pulls off the biggest surprise of the tournament. The Indomitable Lions have a 2 percent chance of beating Brazil. That’s about the same chance as No. 16 seed Weber State had of beating No. 1 seed Arizona in the 2014 NCAA men’s basketball tournament, and far less than the 9 percent chance Mitt Romney had of beating President Obama in 2012 (according to an Election Day read from FiveThirtyEight prime). Neither overcame the odds. If Cameroon can’t win, a tie could upend the group’s seedings. Brazil would finish with five points and a +2 goal differential, meaning it wouldn’t be guaranteed the top slot coming out of Group A, but it would make it to the next round. But if Brazil wins, which it has a 90 percent chance of doing, it isn’t guaranteed the top slot. That depends on what happens when Croatia and Mexico face off as Brazil and Cameroon are still on the pitch. The winner of Croatia vs. Mexico will advance to the Round of 16. If Mexico beats Croatia by two goals more than Brazil beats Cameroon, then Mexico will be the top seed. (There’s another, unlikely scenario that has Mexico beating Croatia by only one more goal than Brazil and Cameroon’s margin that can still give Mexico the top seed, but we’re dealing with enough scenarios already.) For what it’s worth, FiveThirtyEight’s model predicts that Brazil will beat Cameroon by about three goals more than Croatia beats Mexico. What we do know for sure: Croatia almost certainly needs a win (a 39 percent chance) — a tie will work only if Brazil loses, and we know the odds of that happening (2 percent, remember?). If Croatia loses, it’ll be out of the tournament; if it ties, advancement will be a long shot. Mexico is in better position: All it needs to do is tie or win (31 percent chance), and it’ll go on to the knockout stage. I’d say that’s the simplest of scenarios, but it gets complicated again when we try to predict whom Mexico will face in the Round of 16. That depends on the outcome of the Netherlands and Chile match … which brings us back to the beginning. Falling behind the Portuguese was not the start the U.S. wanted Sunday. Entering the match, Portugal had never failed to win a World Cup match when scoring first (11-0-0), and the U.S. had never won when allowing the first goal (0-16-4). After conceding the goal, the United States played well for the rest of the first half, eclipsing its shot total from the entire Ghana match, but trailed 1-0 at the break. This also was cause for concern, because Portugal had won all eight of its World Cup matches when leading at halftime, whereas the U.S. had earned only one point in 15 tries when trailing at half (2010 vs. Slovenia). The Americans’ equalizer came from an unlikely source. Jermaine Jones scored for the first time in 27 matches for his country and did so on a shot from outside the penalty area. It was the third goal the U.S. has scored from outside the box since the 1950 World Cup. Clint Dempsey gave the U.S. the lead with his sixth touch in the attacking penalty area, which led all players in the match, but the Americans could not hold the lead. Silvestre Varela’s goal at 90 minutes + 4:33 is the latest recorded World Cup goal in a 90-minute match. The equalizer came on a cross by Cristiano Ronaldo, his only cross attempt of the match. Still, it was one more cross than the Americans completed; they were 0 for 14. Portugal completed 85.2 percent of its passes, the second-highest percentage allowed by the U.S. in a World Cup match since 1950. The highest was 85.9 percent in a 2-1 win against Colombia 20 years ago to the day. Portugal took the early lead on Nani’s fifth-minute goal, the seventh World Cup goal the U.S. has allowed in the first five minutes of a match — the most in World Cup history. All of those goals have come since 1998, and they have come in six of the U.S.’s past 15 matches. CORRECTION (June 23, 11:58 a.m.): An earlier version of this article misstated the position Geoff Cameron played for Stoke City; he played right back, not right midfield.